first off i have to say i have absolutely no idea how anyone manages to make and blog at this time of year. but at least i’ve been doing the making, the blogging will catch up eventually. i’ve had great fun swatching cashmere. cavalierly tossing it into the washing machine with casual glee was possibly the highlight, although sitting with the washed swatch draped across my arm all evening because i just couldn’t put it down (i’ve never touched pure cashmere before) was another. it turns out that i should read auctions a little more carefully. what colourmart lists as 4ply actually varies significantly in weight. this is fully detailed in the auctions but until you have it in your hand the difference between 2/16 and 2/13 is rather opaque. eventually i worked out a balance between my various “4ply” yarns and the triple wound white laceweight that turned up at the last moment to save the day (white isn’t available very often, apparently, and they weren’t expecting any new 4ply for a while). i’m using the pink and green yarns (both 2/13) singly and the orange and blue (4/28 and 2/16 respectively) doubled, which balances weight-wise pretty well with the white (triple-wound 2/36). the first number refers to the number of plies, the second to the meterage per gram, so it’s logical and equivalents can be calculated, but the real world difference between the weights has to be felt i think. for those in less of a purchasing frenzy (if i didn’t jump all at once i probably would have had sober second thoughts and not bought at all :)) the sample set of different weights would be a very wise investment. i knitted the swatches on old uk size 10s (3.5mm) which i think were just a mite too large, i’ve ordered some addi turbos in 3mm. the finished fabric is uber-drapey and could take a little more body. the cashmere itself is much flatter than an equivalent wool - the moss stitch borders have flattened significantly after washing. it’s also quite crushable, without so much of that wooly spring (although the knitted fabric structure still gives it reasonable stretch and recovery). the difference before and after washing is amazing. because the yarns are oiled for machine knitting they bloom significantly after a swim. the main thing i wanted for a baby blanket was machine washability so i’m treating my swatches mean, a full 40 degree wash minimum, although tumbling’s not so important to me. i’ll wash at least another couple of times before i set to work on the real deal, to see how well it’s likely to hold up. 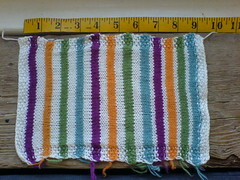 it’s shrunk exactly as predicted: 10% in the length, but barely at all across the width. i just can’t get enough of the softness, and i love the colours, although i’m not overly taken by the way the colours interact in the moss stitch border. am wondering if it’s even slightly possible to put a white border all around, but the practicalities of that (and the additional ends i guess it would entail) makes my head hurt. i might go for plain stockinette and crochet the border instead.